With this recipe, you won't have to choose between Caesar salad and potato salad. It combines them, giving you the best of both worlds. Cook potatoes in pan of boiling water 10 to 12 min. or just until tender; drain. Place potatoes in large bowl. Add dressing; toss to evenly coat potatoes. Add remaining ingredients; mix lightly. Serve warm. Add 1/4 cup Oscar Mayer Real Bacon Bits to salad before serving. 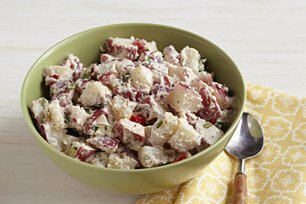 This flavourful potato salad is equally delicious served chilled. Cool completely before refrigerating several hours or until chilled.